Possibly the biggest game in Europe this weekend is the Italian Serie A matchup between first place Juventus and second place AS Roma. 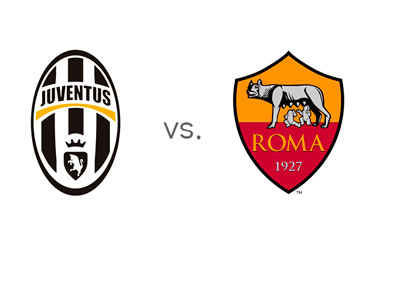 The game will take place on Sunday, January 5th, 2014 at the Juventus Stadium in Turin, with the kick-off at 8:45pm. Juventus are a force in Serie A this season where they have won their last nine games. If they manage to beat Roma on Sunday, they will create an eight point cushion at the top of the tables. Juve are at full strength for the upcoming match with Carlos Tevez and Andreas Pirlo set to return to the line-up. Most recently, Juventus beat Atalanta 1-4 away on December 22nd. Over the last nine Serie A games, Juve scored 23 goals and conceded only 1. In the UEFA Champions League, on the other hand, it was a different story. Antonio Conte's men did not make it past the group stage this season and will have to continue their international journey in the Europa League. After seventeen games played in Serie A this season, AS Roma are undefeated with twelve victories and five draws. Along the way, they have scored 35 goals and conceded only 7; this is by far the lowest number of goals conceded in the Italian league this season. If Roma were to beat Juventus on Sunday, they would come within two points in the tables. Most recently, Roma beat Catania 4-0 at home. Juventus are the big favourites to win on Sunday. A 100 € bet on the Old Lady could return 61 € in profit, while the same bet on Giallorossi could return 450 € in profit. The most likely score, according to the odds, is a 1-1 draw, offered at 6/1. 1-0 victory for the hosts is valued at 13/2, while a 0-1 upset is valued at 16/1. Carlos Tevez, who has scored 11 goals so far in Serie A this season, is the favourite to get on the scoresheet at 4/1. Francesco Totti is the favourite to score for Roma at 8/1. This is a big game in Italian football. If Juventus win, the season is pretty much over. If AS Roma can pull off an upset, things are interesting again.